These beauty gift boxes are the perfect way to say THANK YOU to your deserving bridesmaids. Each gift box is adorably packaged as shown and includes 4 lovely, handmade beauty items for pampering. 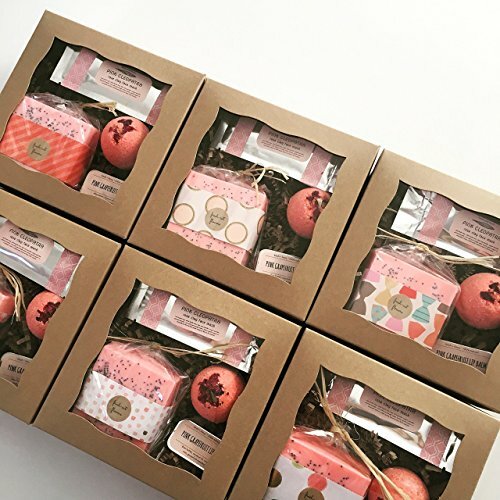 Each gift box includes: 1- bar wrapped soap 1- natural clay face mask 1- shea butter lip balm tin 1- bath bomb You may choose your soaps to match the theme of your wedding or just choose your bridesmaid's favorite scent. Each box is ready to give with your choice of label on top. You can choose from the following labels: -Thank You for being my Bridesmaid -Thank You for being my Maid of Honor -Will You be my Bridesmaid? -Will You be my Maid of Honor? -Will You be my Matron of Honor? -Treat Yo'self -Pamper Gift Set -CUSTOM LABEL +$5 (leave in notes to seller box at checkout) If this a gift being sent directly to the recipient please double check the SHIP TO name and address are correct. Also mark the item as a GIFT and leave a GIFT MESSAGE if you would like a card included so they will know who the lovely gift is from. You will only receive a card if requested. If you have any questions about this product by kitschandfancy, contact us by completing and submitting the form below. If you are looking for a specif part number, please include it with your message.